Located in the Ragged Hills section of Pomfret are the remains of a small deserted 18th-century colonial settlement. Named Bara-Hack by the area’s original residents, it has since earned such eerie monikers as The Lost Village of Pomfret, The Village of Ghostly Voices, and The Haunted Village of Lost Voices. These titles come courtesy of paranormal enthusiasts who believe a variety of spiritual entities inhabit the settlement’s remains. Higginbotham set up a waterwheel and small mill along Nightingale Brook and the two men, operating as Higginbotham Linen Wheels, began producing flax wheels (a type of spinning wheel) for sale to neighboring communities. Settlement in the area lasted less than a century, however. The eventual deaths of Bara-Hack’s founding families, the decline of business, and the exodus of residents ended life in the small enclave. By the turn of the 20th century, the village was uninhabited. Is the Abandoned Village Haunted? As nature slowly reclaimed Bara-Hack, the settlement became a place of curiosity for those interested in colonial remains. 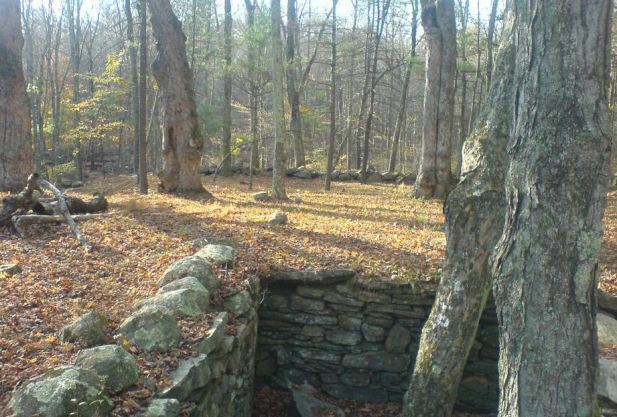 An old cart path off Ragged Hill Lane led to cellar holes, building foundations, and a cemetery (the final resting place for numerous Randall and Higginbotham family members and their slaves) that drew visitors into the woods of Pomfret. It was then that tales of paranormal activity at the site became popular. Visitors to Bara-Hack claimed they heard voices, sounds from domesticated animals, and noises made by ghostly horse-drawn buggies passing by. In addition, newspapers reported sightings of bright orbs and streaks of light swirling over the cemetery. Researchers even found records of the most common sighting, that of a infant apparition reclining in a tree, reported by slaves of the Randall family hundreds of years earlier. In 1971, Paul Eno, a student and paranormal researcher, visited the site with a number of colleagues. Eno reported seeing a bearded face hovering over the cemetery for several minutes, as well as a host of other paranormal activities. The attention these reports focused on Pomfret brought unwanted attention to the area and resulted in the eventual denial of public access to Bara-Hack. Today, the old settlement resides on private property and remains closed to the public.